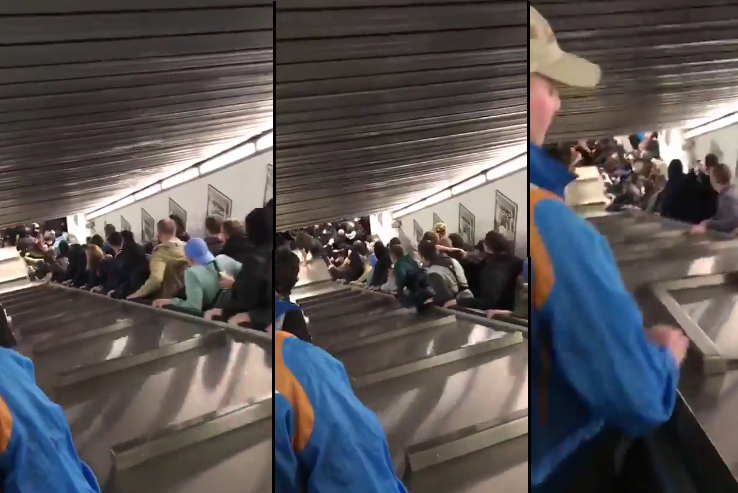 A broken down escalator in a Rome metro station left 24 Russians injured yesterday evening, just as the fans were heading towards the Olympic stadium to catch their favorite CSKA Moscow team face off with AS Roma in the Champions League. The accident, which was caught on video, saw multiple passengers speeding downwards at an ever faster rate as a pile of people lied on the floor. Seven people were reported to have been seriously injured, according to the Italian media, citing firefighters. None of the injuries were reported to be life-threatening. Rome officials closed the metro station after the incident. The provincial fire chief Mr Giampietro Boscaino declared to have seen "people one on the top of the other looking for help. They had various injuries caused by the escalator that was twisted, therefore serious injuries." The video was soon shown on Italian state television RAI which also asked people to stay away from the scene so fire officials could respond quicker and not be disturbed. The newly elected Mayor of Rome, Ms Virginia Raggi visited the metro station soon after and claimed that "from what witnesses have said, it seems that some fans were jumping and dancing on the stairs." To add insult to injury, the game between the two teams that evening was won by the Italians with 3-0.